But the rural association with farming has not always been the case argues Jane Jacobs in her classic 1970 book “The Economy of Cities”. In work more recently confirmed by scholars such as Danish economist Ester Boserup, Jacobs says that the prehistoric importance to human survival of trade meant densely populated sites focused on exchange formed even earlier than agriculture was adopted. Materials like obsidian for making tools for hunting were involved in a robust economy that only later included items like edible seeds and young animals – the keys to domestication and agriculture. When organized agriculture began to flourish, these ‘exchange sites’ grew dramatically, both in population and complexity. Eventually some agricultural work migrated to land surrounding these emerging cities but much agricultural work remained within cities over the millennia. 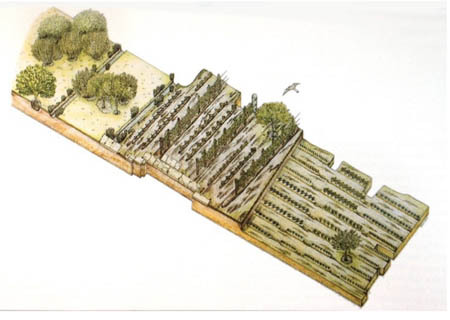 In what is now modern Mexico and Central America, for instance, the precursors to the Aztec Empire were supported by urban garden plots as early as the 14th century BC. In medieval Italy the real marker of political power was control of food resources. According to Dr. Caroline Goodson at the University of Cambridge, more than military force, legislative authority, or religious ceremony, the ability to secure food supplies meant wealth, social status, and legitimacy. Much productive land was actually urban and these lands were highly valuable and carefully controlled. Households farmed lands within city-walls and there is little evidence for commercial food markets of rural produce. Charters documenting property transfers of urban cultivated land — including domestic vegetable patches, independent fields within the city-walls, and orchards and vineyards between houses — appear in documents of the late sixth century, rising in frequency up to the late eleventh or twelfth centuries, when population pressures meant that most farming moved outside the city. Kitchen gardens and fruit tree groves were sited within walled cities in Europe during the Middle Ages. Such areas were often established by monasteries to help feed the monks living within. Produce was also sold in local markets to supplement the monasteries’ incomes. The plants and herbs they cultivated served both as food and medicine to their cities’ populations. Here we find evidence that today’s concentrated-animal feedlot operation originated in cities. Of course cities didn’t just innovate techniques that would later become associated with large-scale, chemical-dependent agriculture, they also incubated sustainable ones. The so-called “French-intensive” method of growing vegetables — in which large amounts of compost are added annually to densely planted raised beds — is one of the most productive and sustainable forms of organic agriculture used today. And guess what? It developed not in the countryside, but rather within the crowded arrondissements of 19th century Paris. The French-intensive method hinges on a principle identified by Jane Jacobs, one that modern-day city residents (and planners) should take to heart: that cities are fantastic reservoirs of waste resources waiting to be “mined.” Like all cities of its time, 19th-century Paris bristled with horses, the main transportation vehicle of the age. And where there are lots of horses, there are vast piles of horse manure. The city’s market gardeners turned that fetid problem into a precious resource by composting it for food production and using it in beds and under large glass “clotches” to heat and fertilize vegetables. This recycling of the “transportation wastes” of the day was so successful and so extensive that the soil increased in fertility from year to year despite the high level of production. Paris’s market gardeners supplied the entire metropolis with vegetables for most of the year — and even had excess to export to England. 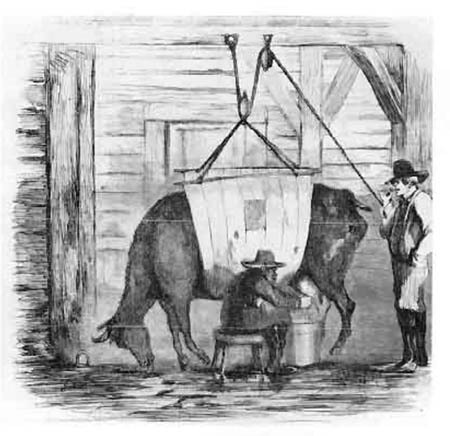 At the same time, in this country, farmers from all over the midwest would haul their hogs and cows to Chicago’s vast slaughterhouses, where they would be fed in pens while awaiting their fate. Operating for over a century, starting in the mid-1800s and not closing for good until 1971, this vast meatpacking enterprise at its height dominated the city. More meat was packed each day here than anywhere else in the world. According to the Chicago Historical Society, by 1900 the stockyards “employed more than 25,000 people and produced 82 percent of the meat consumed in the United States.” Started and owned by a group of railroad companies, the yards were where well-known meat-packing giants like Armour and Swift got their start. The first community gardens in the United States were vacant lot gardens started during the economic recession of the 1890s. Detroit was the first city in the United States to create an extensive municipally sponsored urban gardening program using vacant lots in the city. Mayor Hazen Pingree started the program in response to the economic recession that began in 1893, which left many of the city’s industrial laborers, particularly recent Polish and German immigrants, unemployed and hungry. Pingree developed a program to substitute labor for charity. 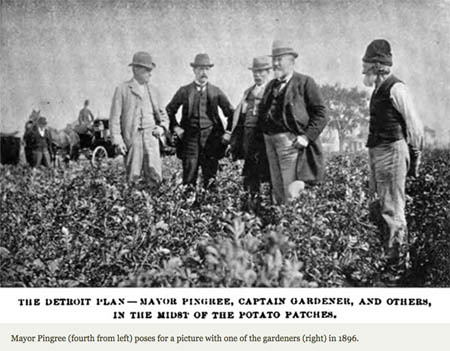 He arranged for landowners to lend their properties to the local government, which were utilized by 945 families as gardens for produce—primarily, potatoes. The City invested $3,000 in “Pingree’s Potato Patches,” and showed a $12,000 profit a year later. 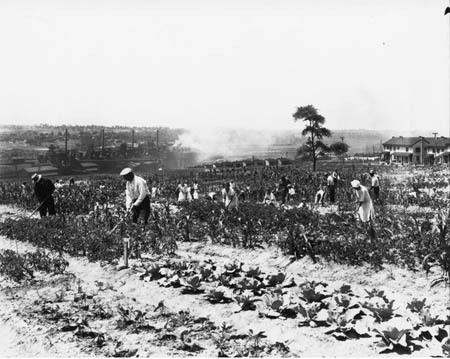 Gardening became compulsory for those receiving government assistance. Soon cities such as Boston, Chicago, and New York subsidized similar gardening programs. In 1891, Boston inaugurated the nation’s first school gardening program. Children were taught agrarian skills for work deemed less draconian than earning wages in factories. 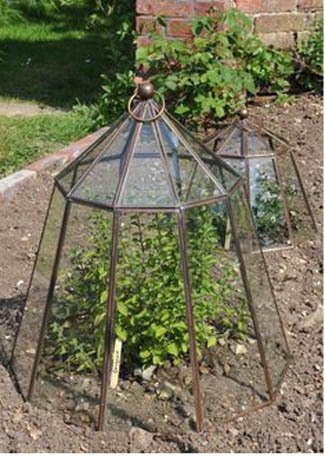 Incorporating gardening in the curriculum was believed to instill a strong work ethic, and teach “appropriate social behavior to immigrants, delinquents, and the infirm”. 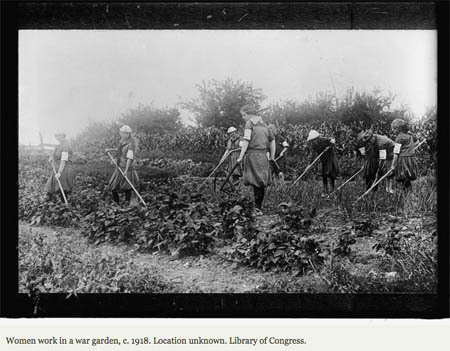 At the start of World War I, Europe was in the midst of catastrophic food shortages and the need for food became the primary motivation for cultivating community gardens. Once the U.S. entered the war large tracts of land were prioritized for food to be exported overseas. 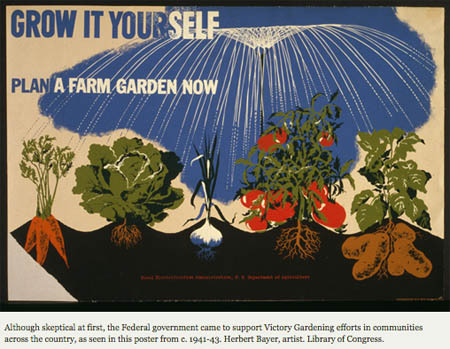 To supplement food domestically Herbert Hoover, Director of the U.S. Food Administration, established a national gardening campaign. Americans enthusiastically plowed backyards, vacant lots, and municipal land. Slogans such as “Sow the Seeds of Victory,” rallied 5 million gardeners to produce an unprecedented $520 million worth of food. Gardening became a patriotic act. The nature of community gardening changed with the onslaught of the Great Depression. Like vacant lot cultivation during the 1890s, the subsistence gardens in American cities during the 1930s were created in response to an economic crisis and intended to help meet residents’ immediate need for food. They were often supported through partnerships between municipal government and community organizations. By 1934, 2.3 million subsistence farmers produced more than $36 million worth of food. 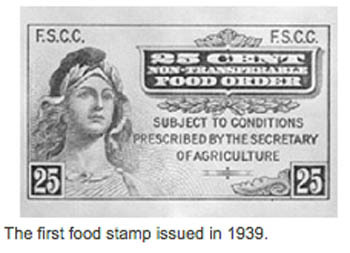 In 1939 Roosevelt’s New Deal Program essentially exchanged federally supported gardens for USDA food stamps, regarded as a more “efficient” system to feed the hungry. When the United Sates entered World War II after the attack on Pearl Harbor in 1941, many Americans participated in a grassroots effort begun to rekindle the patriotic liberty gardens of WWI. At first the federal government was skeptical of supporting these efforts like they had before. Officials thought large-scale agriculture was more efficient. Citing the health, recreational, and morale-boosting effects of gardening, however, the government again supported a national gardening campaign during World War II. After World War II — during which town and city gardens provided some 40 percent of vegetables consumed in the United States — city residents no longer needed to garden for their sustenance. The easy fertility provided by synthetic nitrogen fertilizer made the kind of nutrient recycling performed by Paris’s urban farmers seem obsolete and backwards at the same time that the rise of fossil fuel-powered transportation banished the horse from cities, taking away a key source of nutrients. Food production became a “low value,” marginal urban enterprise, and planners banished it from their schemes. Supermarkets, stocked year-round with produce from around the world and a wealth of processed food, more than filled the void. In urban communities throughout the nation, segregation laws placed a chasm between African American and white neighborhoods. The economic boom of the 1950s was the catalyst for “white flight,” as white urbanites retreated to the comfort and prestige of new suburbs. White urban communities shrank exponentially while African American communities swelled, eventually extending into abandoned white neighborhoods that were once off limits. Services in these areas, such as supermarkets, followed the White dollar, leaving only small grocery stores, offering a poor selection of produce, liquor stores, and fast food chains. Across the country, the postwar urban manufacturing base began to melt away in the 1970s, as factories fled to the union-hostile South, and later to Mexico and Asia. Meanwhile, the highway system and new development drew millions of white families to the leafy lawns of the exurban periphery. As the jobs and whites left the cities, so did the economic base sustaining the private food system. Urban African Americans and Latins of low socioeconomic status thus live in areas that lack sufficient sources of healthful foods. These communities, known as food deserts, are defined as areas where residents have limited access to healthy fresh nutriments, particularly if they are poor and have limited mobility. According to the World Health Organization (WHO), “low fruit and vegetable intake is among the top ten risk factors related to [disease] and mortality”. The Centers for Disease Control (CDC) has reported that African Americans have a fifty-one percent higher instance of obesity than Caucasians, with Latinx following at twenty-one percent; both communities are also predisposed to type 2 Diabetes, cardiovascular disease, and certain cancers. Since the 1960s and 1970s, however, people and grassroots organizations have also come together to build community gardens that promote environmental stewardship and revitalize urban neighborhoods affected by disinvestment. Urban food production had been slowly taken up by a population of new residents who had come to the city during and after the World Wars, seeking economic and personal opportunity. Six million African Americans, part of one of the largest internal migrations in history, left the rural South and moved into Midwest and Northern cities between 1916 and 1970, with the largest flows occurring during and after World War Two. These residents changed the character of northern cities, bringing in a new immigrant population with rural backgrounds and tastes in food. It did not take long for urban land to again sprout gardens, this time filled with “soul” food. But titanic amounts of the food that enters cities each year leaves as garbage headed to the landfill — a massive waste of a resource that could be composted into rich soil amendments, as Paris’ 19th-century farmers did with horse manure. According to the EPA, fully one-quarter of the food bought in America ends up in the waste stream — 32 million tons per year. Of that, less than 3 percent gets composted. The rest, landfilled, slowly rots and emits methane, a greenhouse gas 21 times more potent than carbon dioxide. The EPA reports that wasted food in landfills accounts for a fifth of U.S. methane emissions: the second largest human-related source of methane in the United States. In 1993, a former professional basketball player and corporate marketer named Will Allen purchased a tract of land on the economically troubled North Side of Milwaukee, Wisconsin. Allen hoped to use the space to open a market that would sell vegetables he grew on his farm outside Milwaukee. But then, working with unemployed youth from the city’s largest housing project, nearby Westlawn Homes, Allen soon began growing food right in Milwaukee. Eventually, that effort would morph into Growing Power, now the nation’s most celebrated urban-farming project. Milwaukee’s Growing Power has turned the urban waste stream into a powerful engine for growing food. Most urban agriculture operations today are net importers of soil fertility — they bring in topsoil and compost from outside to amend poor urban soils. Growing Power has become a net exporter. 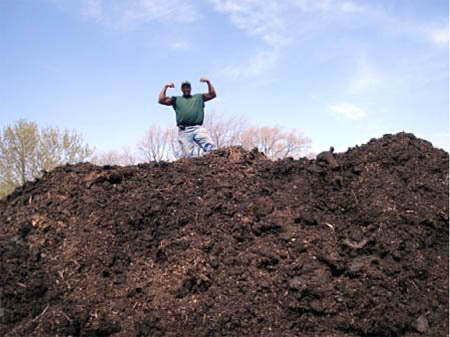 In 2008, as the New York Times Magazine reported in a profile of founder Will Allen, Growing Power converted 6 million pounds of spoiled food into 300,000 pounds of compost. The organization used a quarter of it to grow enough food to feed 10,000 Milwaukee residents — and sold the rest to city gardeners. In many urban neighborhoods around the country, community gardens have fiercely loyal protectors who have mobilized in recent years as their city has targeted gardens as sites for affordable housing, and private developers have also eyed them for high end development. In 2017 the New York City Parks Department’s Green Thumb program — the nation’s largest community garden program — grew to 553 gardens, up from 501 in 2009. Most of the gardens sit on city-owned or other public property, and are maintained by community groups and a dedicated corps of 20,000 volunteer gardeners. About 3.2 million New Yorkers, or 38 percent of the city’s population of 8.5 million, were born in other countries, according to an analysis of census data by Queens College. About half of those immigrants came from the Caribbean, Central America and South America. 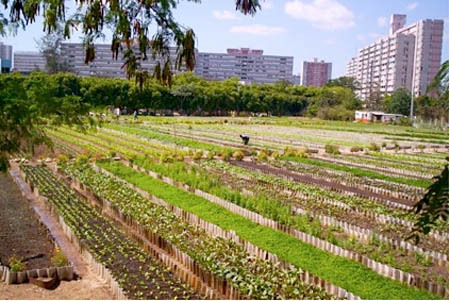 A large percentage of the people involved in urban agriculture are the urban poor. Contrary to general belief they are often not recent immigrants from rural areas (since the urban farmer needs time to get access to urban land, water and other productive resources). Women constitute an important part of urban farmers, since agriculture and related processing and selling activities, among others, can often be more easily combined with their other tasks in the household. It is however more difficult to combine it with urban jobs that require travelling to the town centre, industrial areas or to the houses of the rich. In much of the world urban populations who work in agriculture are significantly better nourished than their counterparts in non-farming households. In Kampala, where urban producers obtain 40 to 60 percent or more of their household food needs from their own urban gardens, children aged five years or less in low-income farming households were found to be significantly less stunted than children in non-farming families. It is estimated by the UN that worldwide 200 million urban residents provide food for the market and 800 million urban dwellers are actively engaged in urban agriculture in one way or another. These urban farmers produce substantial amounts of food for urban consumers. A global estimate is that 15-20% of the world’s food is produced in urban areas. Research on specific cities and products yield data like the following: in Hanoi, 80% of fresh vegetables, 50% of pork, poultry and fresh water fish, as well as 40% of eggs, originate from urban and peri-urban areas; in the urban and peri-urban area of Shanghai, 60% of the city’s vegetables, 100% of the milk, 90% of the eggs, and 50% of the pork and poultry meat is produced; in Java, home gardens provide for 18% of caloric consumption and 14% of proteins of the urban population; Dakar produces 60% of the national vegetable consumption whilst urban poultry production amounts to 65% of the national demand. Sixty percent of the milk consumed in Dakar is produced in/around the city; and in Accra, 90% of the city’s fresh vegetable consumption is from production within the city. Over 26,000 popular gardens cover 2438.7 hectares in Havana and produce 25,000 tons of food each year; a total of 299 square kilometres of urban agriculture produces 113,525 tons/year. Urban agriculture to a large extent complements rural agriculture and increases the efficiency of the national food system in that it provides products that rural agriculture cannot supply easily (e.g. perishable products, products that require rapid delivery upon harvest), that can substitute for food imports and can release rural lands for export production of commodities. From its beginnings in prehistoric time, agriculture has been a part of city living. It has its own set of problems and opportunities, distinct from those of rural agriculture. And in the United States often its practitioners are women, the poor, marginalized populations and immigrants. Yet the quest to provide for yourself, to experience the mystery of life that farming requires, and to create healthy, tasty, nutritious food for your community and your family are the same no matter what kind of growing you do.